Vufine+ is a high definition, wearable display that seamlessly integrates with your technology, truly unlocking its full potential. Whether for your smartphone, laptop or drone, Vufine+ connects via HDMI cable to provide a second monitor or mirrored display. Use Vufine+ anywhere you need an extra screen without taking your eyes off the world around you. Great for Drones, Cinema, Travel & Work!! Unlike standard goggle set-ups, Vufine lets you maintain situational awareness and direct line of sight while flying. Vufine stands out as a simple, safety-conscious monocular FPV system. Whether for an action camera or professional rig, Vufine+ is perfect for monitoring live camera footage. For gimbal operators, it's great for maintaining situational awareness on location. Vufine’s sleek, pocketable size is ideal for on the go use, making it easy to watch your favorite videos, view maps and directions or catch up on work privately. Use as a second monitor while working. The small design is great for small spaces and allows you to view many documents, code snippets and more to increase efficiency. Use Vufine+ anywhere you need an extra screen without taking your eyes off the world around you. Crisp, high definition display that allows users to easily watch videos or read text. Virtual screen appears as a 4 inch display approximately 12 inches from the user's eye. Vufine connects to devices only through an HDMI cable. No wireless capabilities. Vufine only accepts a 720p signal. Vufine+ is highly portable and compact in an elegant, comfortable design. Internal battery for a 90 minute runtime. Battery can be charged while Vufine is in use for extended duration. 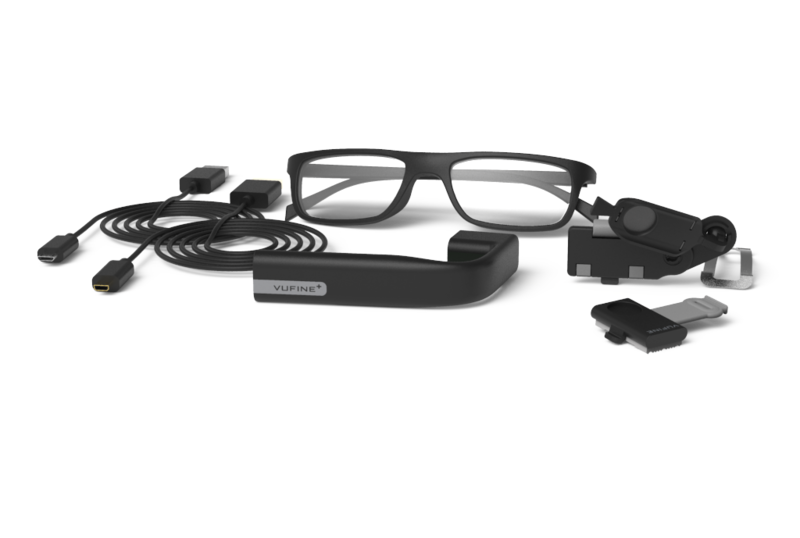 The Vufine+ includes the Vufine+ wearable display, Plus and Standard magnetic docking stations, 1 HDMI and 1 USB cable, 1 pair of non-prescription glasses with microfiber carrying case. Vufine utilizes an LCOS panel which provides a bright, crisp virtual display. The screen appears as a 4 inch display approximately 12 inches from the user’s eye. Vufine can be positioned above, below, or directly in the user’s line of sight depending on personal preference. Vufine+ offers 3 different display modes to allow users to optimize the display no matter what device they are using. Appropriate adapters may be needed depending on your source device. Vufine does not have any built-in wireless capabilities. Wireless capabilities must come from the source device. Vufine only accepts a 720p signal. You may need to force 720p within the settings of your device or through the use of a converter. The perfect compliment to your Vufine+ Wearable Display, shop hat and headband mounts, docking stations, cabels and more. Whether for your smartphone, laptop, or drone, Vufine is a simple and highly accessible companion device that redefines your experience with technology. This wearable display is perfect for increasing situational awareness when flying a Drone. I fly an Inspire 2 Drone which has the Camera for capturing footage, and a FPV camera that always points in the direction of the nose. With the Vufine Wearable display I can see FPV of what the drone sees in front of it while still looking at the Drone in flight. Allows me to take photos and videos in areas I could not otherwise. As a full-time commercial and editorial photographer, I often need to position my cameras where my body/head can't fir...or it may be too dangerous to get behind the viewfinder. Now, I have few limitations moving with a camera, low shots, hight shots, shots around corners...all fast and intuitive. I like that it's small enough to always bring along. as I never know where my creativity will lead. I'm on the road a ton for work, and one of the things I miss when on the road is my second monitor, which admittedly doesn't fit very well into my carry on bag. Vufine has been a nice addition to my repertoire, effectively allowing me to bring along a second screen without having to lug along another monitor. I also enjoyed the privacy aspect when stuck in the middle seat on a long flight home. We are a small, creative company dedicated to building simple and accessible wearable technology.